Anyone who reads my articles knows that I seriously urge folks to have basic skills before relying totally on technology. Use a GPS to navigate? Great, so do I. But you had better know how to use a map and compass in case your GPS fails. And a way to navigate without a compass in case it breaks or gets lost. I do. Alternative power options for your home when you are facing a SHTF situation, especially grid down, are numerous. Backup generators and large solar panels are just two. But what about if you are on the move? Either by vehicle or foot? Most of the devices you may be using will be battery-powered either by its own internal battery, or by AAA/AA or D cell batteries. These items would include a cell phone, various sizes of flashlights, battery-powered lanterns, a GPS, emergency radio, two-way radios, any item that can be charged with a USB cable, and a head light to name just a few. To keep these going, you have a choice of carrying a large amount of spare batteries (and the ensuing weight) or using rechargeable batteries. But how can you recharge them on the go without access to electrical outlets? Portable solar panels are one option. A hand powered crank generator is another. Lets break down our solar equipment possibilities into two categories: Those items light enough to be carried in your bug out bag or on you if you are on foot. And those items that could easily be transported by vehicle if you are traveling in your bug out buggy. There is one fundamental truth about a bug out bag: If it is too heavy for you to effectively carry in an emergency, it is useless. You either have to lighten the load in a hurry( and run the risk of ditching a vital item) or move so slow as to be easy prey for any number of threats. So you want to plan your bug out bag carefully. The following items are discussed from the point of view of possible aids to your bug out plan, and not to be considered essential or gospel. Lets look at man portable solar charging kits to begin with. Goal Zero Guide 10 Plus. This is a man portable solar panel kit which includes Nomad 7 solar panel and Guide 10 Plus power pack. This kit weighs in at 1.2 pounds, and the dimensions are 6.5 x 9.5 x 1.8 inches. This would easily fit in your bug out bag. The power pack can charge AA/AAA batteries. With a D cell adapter, your AAA batteries can be used to supply any D cell item such as a flashlight. The power pack will charge AA or AAA batteries. Inputs: Mini USB (5V), Solar port (6.5V). USB Power Output: 3.5W. Solar Power Output: 7W. The battery pack has a built-in LED flashlight. Any AA or AAA* NiMH batteries can be used . You can charge directly from the panel, or from the battery pack. Will charge 4 AA batteries at once. This is one of the more popular portable solar kits and has overall great reviews. 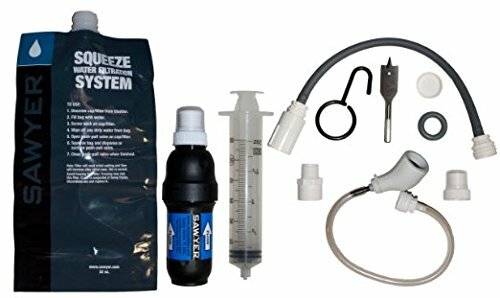 There are a number of combinations that can be set up with this kit. Manufacturer claims that you can directly charge a smart phone in 1 hour. You can arrange the panels on your rucksack to charge while you are moving. The SunJack 14W Portable Solar Charger With 8000mAh Fast-Charge Battery. This is another popular portable solar charging unit. It charges an attached battery pack that can then charge a variety of devices by USB. It Folds to compact size of 6.75″ x 9.25″ x 1.75″ – similar to an iPad, and weighs about 2 pounds . These can be had in 7, 14, and 20W power outputs. You can buy an additional battery charger that will charge AA/AA batteries using a USB cable that plugs into the battery. Suntactics sCharger-5 Portable Solar Charger is another man portable charger. This unit by American company Suntactics is waterproof and weighs 8 oz. You can plug your USB cable into it directly. It r up to 6 watts, outputs up to 5 watts continuous, 1.2 amps, 5 volts. You can buy a supplemental storage battery for it also. The above three kits are examples of portable solar panels light enough to carry when bugging out and capable of charging devices through USB, and charging AA/AAA batteries which, with an adapter, can also be used in D cell devices. You can buy various adaptors to charge most small electronic devices. There are a number of useful solar-powered items that are portable enough to go in your BOB. The Luci Foldable Solar Lamp is an excellent example. It will fold to the size of a CD disk. It has 3 Light settings – Bright, Super Bright and Emergency Flash. It is very Light (4 oz.) – Packs Small – Inflates in seconds – Hang Handles top and bottom. 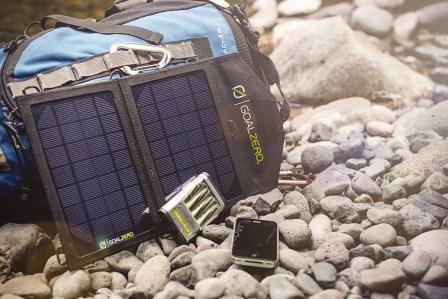 Goal Zero makes an excellent line of solar equipment. Their Torch 250 Flashlight with Integrated Solar Panel is not only an excellent flashlight, but it had a built-in USB cable and a hand crank. It has multiple light options that allow you to use it as a 250 total lumen output flashlight, floodlight or red emergency light. It weighs 14.4 ounces and measures 10 x 1.8 x 3.5 inches. You bug out bag should be a reflection of your overall bug out plan. Once you have carefully considered what electronic items you will carry with you, then you can evaluate whether a portable solar charger is appropriate. Portable solar panels can be useful if they are used within their limitation. To begin with, charging with them is time intensive. On a bright sunny day it can take up to an hour just to charge your cell phone. All three of the solar panel kits mentioned can be placed over your ruck sack and charge as you go along, however solar panels can also be light reflective. Something to keep in mind if you are trying to move in stealth mode. To get maximum use from them, you do indeed need bright sunlight. The less sunlight you have, the slower they are to charge. Even where I live on the edge of the Sonoran Desert, we have long periods of time where the sky is overcast. Consider the climate conditions in your operational area when planning to use solar charging. And as always, do your research to ensure you buy the proper equipment for your needs. In Part 2 we will consider solar equipment suitable for vehicle transportation when bugging out.